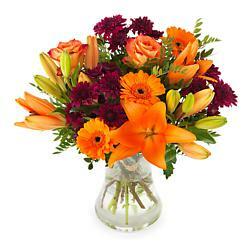 Chrysanthemum flowers are contained in the following bouquets which are available for next day delivery in the UK. Chrysanthemums, often called 'mums' or 'chrysanths', are a genus in the family Asteraceae. These pretty, round-faced flowers are native to Asia and North-eastern Europe. Chrysanthemums were first cultivated in China as a flowering herb as far back as the 15th century BC.